PUNE: From soup and salads, tomato serves as a primary ingredient in Indian food. It is nutritious, loaded with antioxidants and vitamins. But keeping tomatoes free from ‘early blight’ disease is a challenge for farmers. Now a group of Indian scientists has found a way to develop tomatoes resistant to the most common disease – early blight (EB). 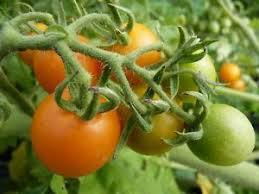 They have identified biochemical and molecular mechanisms in wild tomato that makes them resistant to early blight. This knowledge can be used to improve commercial varieties and develop tomato cultivars resistant to EB in future. The study has been published in journal Plant Molecular Biology recently by scientists from the National Chemical Laboratory, Savitribai Phule Pune University and Weizmann Institute of Science, Israel. The early blight disease is caused by a fungus, Alternaria soloni , and it can lead to 35 to 78% yield loss. It manifests in symptoms like fruit rot, leaf spots and stem lesions. Commercially planted cultivars have low levels of resistance towards early blight than wild varieties. "We studied consequences of fungal infection in wild and cultivated varieties at biochemical and molecular level, and have identified two biosynthetic pathways controlling early blight in tomato leaves - SGA (steroid glycol-alkaloid) and PB (phenylpropanoid biosynthesis),” explained Dr Ashok Giri, one of the team members at NCL, Pune. Once infected, tomato plant produces metabolites known as phytoalexins which are connected with SGA pathway. &quot;The higher levels of phytoalexins are found in in resistant plant than sensitive one. The PB pathway leads to increased lignin biosynthesis which was found to be enhanced in resistant tomato plants. When these metabolite substances are tested, it was found that they possess an antifungal property,” explained Balkrishna Shinde, the lead author. Further studies showed that there was higher expression of a gene, GAME2, in resistant tomato and negligible in sensitive cultivars. Transcripts of GAME2 are predicted to be responsible for conversion of beta-tomatine to alpha-tomatine. Beta -tomatine is non-toxic to pathogen whereas alpha-tomatine showed strong inhibitory effect on fungal growth. “This means GAME2 gene expression contributes early blight resistance in wild tomato. We are focusing on the mechanistic basis that might occur through regulation of gene expression by specific transcription factors,” said Dr. Giri. Researchers also predicted a connection between lignin biosynthesis and A. solani invasion to plants. Resistance variety shows higher levels of rutin, one of the metabolite of PB pathway, which demonstrates fungi-toxic effects.